Constantly compared to her over-achieving older brother, crushed by her parents’ expectations, and bullied at school, Michelle feels her life is hopelessly crashing. Pittsboro Baptist Church's 2018 Judgement House presentation, Treasured, offers a solution to the heartbreak that so many people experience. 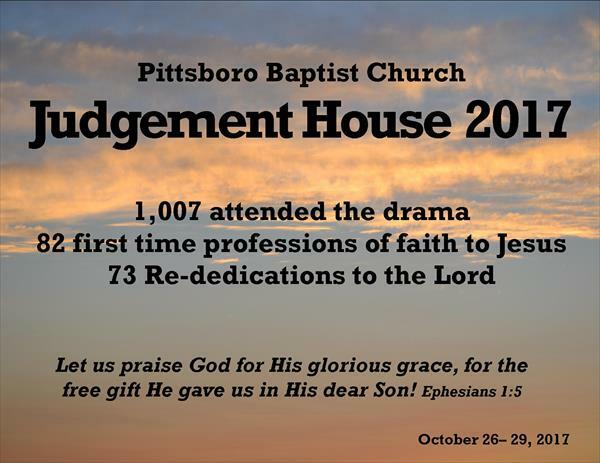 Each October since 2010, Pittsboro Baptist Church has presented Judgement House, a walk-through drama that presents the truth of people's choices versus the consequences of those decisions, both in this life and the next. This year’s presentation, Treasured, will be held October 25-28. Walk-ins are welcome, but reservations are recommended by calling (919) 542-2986 or email Pam at pbccontactus@gmail.com. It takes about an hour to walk through the drama, beginning with the audience boarding a bus at the Kiwanis Club House, 309 Credle Street in Pittsboro. Due to the intensity of some scenes, children under age ten should not attend. There is no admission fee but a $3 donation is encouraged. You do not want to miss this potentially life-changing event. October 25: 7:00 p.m. – 9:00 p.m.
October 26: 7:00 p. m - 11:00 p.m.
October 27: 6:00 p.m. - 10:00p.m. October 28: 5:00 p.m. – 10:00 p.m.
More information about Judgement House can be found at http://www.judgementhouse.org. Home | Admin © Copyright , Pittsboro Baptist Church - Pittsboro, NC. All rights reserved.